Out of all of the books I’ve received, some are okay, some are slightly below average, some are pretty good and some are downright awful. But, occasionally, I’ll receive one that truly, thoroughly impresses me. And it’s a great feeling to find a new author who’s every other work you then feel the need to check out. 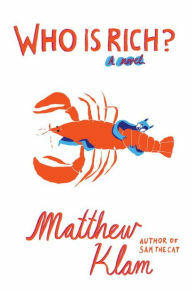 And Matthew Klam’s Who is Rich? Is one of those novels. Every summer, a once-sort-of-famous cartoonist named Rich Fischer leaves his wife and two kids behind to teach a class at a weeklong arts conference in a charming New England beachside town. It’s a place where, every year, students—nature poets and driftwood sculptors, widowed seniors, teenagers away from home for the first time—show up to study with an esteemed faculty made up of prizewinning playwrights, actors, and historians; drunkards and perverts; members of the cultural elite; unknown nobodies, midlist somebodies, and legitimate stars—a place where drum circles happen on the beach at midnight, clothing optional. One of the attendees is a forty-one-year-old painting student named Amy O’Donnell. Amy is a mother of three, unhappily married to a brutish Wall Street titan who runs a multibillion-dollar investment fund and commutes to work via helicopter. Rich and Amy met at the conference a year ago, shared a moment of passion, then spent the winter exchanging inappropriate texts and emails and counting the days until they could see each other again. Now they’re back. The breakdown of such a flawed character in an environment shared with so many other flawed characters allows you the reader to take a wild ride that’s worth the lack of sleep as you continue to read “just one more chapter” to see what happens next. This is a book that will leave you satisfied, happy, and completely enjoying how a talented writer can tell a story and create characters you truly care about. This entry was posted in Books on July 8, 2017 by Drew.